VANCOUVER, Jan. 4, 2018 /CNW/ - Hannan Metals Limited ("Hannan" or the "Company") (TSX.V: HAN) (OTCPK: HANNF), announces completion of a 40.6 line kilometre 2D seismic survey at the Company's 100%-owned County Clare zinc project, which hosts the Kilbricken zinc-lead-silver deposit in Ireland. The regional seismic survey is a first for the area and has delivered a critical new set of subsurface data across Hannan's 35,444 hectare prospecting licence (Figure 1), which will form the basis for current and future drill targeting and prioritization. The survey traversed the most prospective parts of the Clare Basin within Hannan's prospecting licence and was used to identify and map geological structures that may host and control base metal mineralization. 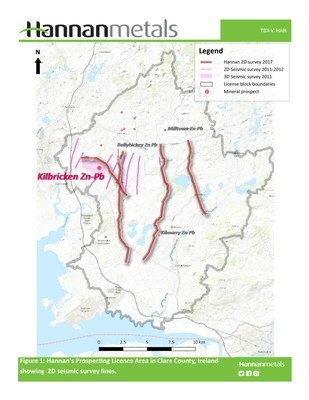 The Clare Basin is considered one of the most mineralized belts in Ireland, with the nation's first base metal discoveries identified in the area in the late 1950's, with continued success including the recent identification of Kilbricken. Hannan's seismic survey propels understanding of the architecture and geological prospectivity of the Clare Basin, in a manner not previously possible. Two drill rigs will restart operations next week after the Christmas break, with the continued aim to step out from the existing resource area at Kilbricken and target adjacent base metal mineralized bodies. Mr. Michael Hudson, CEO and Chairman, states: "The geologically ground-breaking regional 2D seismic survey has delivered the unique and exciting opportunity to map previously unknown large sub-surface structures in south-west Ireland. These structures have the potential to host mineral deposits and will allow for effective drill targeting through 2018. We thank the people of Clare for their patience and understanding during the execution of this large survey." The seismic survey was carried out by Gallego Technic Geophysics and Rees Onshore Seismic Ltd. A total of 34 people were employed to perform the survey. Three north-south lines and one east-west tie line were completed to test for structures in multiple orientations (Figure 1). Processing of the significant amount of data will take many months and tenders have already been solicited.